For years I have seen the bathtub crayons and thought they were cool but never actually purchased them. Then the other day I saw them on Pinterest (if you don't know about pinterest.com check it out it is my new favorite!) and was surprised to realize how easy they were to make. So this morning Bee and I made some. It is essentially making colored soap, which if you have never made soap is much easier then you would think. We used giant bars of glycerin soap, which we had left over from the strawberry soap we made earlier in the summer but you could get at any craft store. We then cut the large block of soap into smaller squares and microwaved the soap in a glass measuring cup for 30 seconds. We then took it out, mixed it and microwaved it for another 15 seconds. 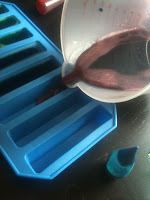 After the soap was entirley melted we added food coloring to the liquid soap and stirred. 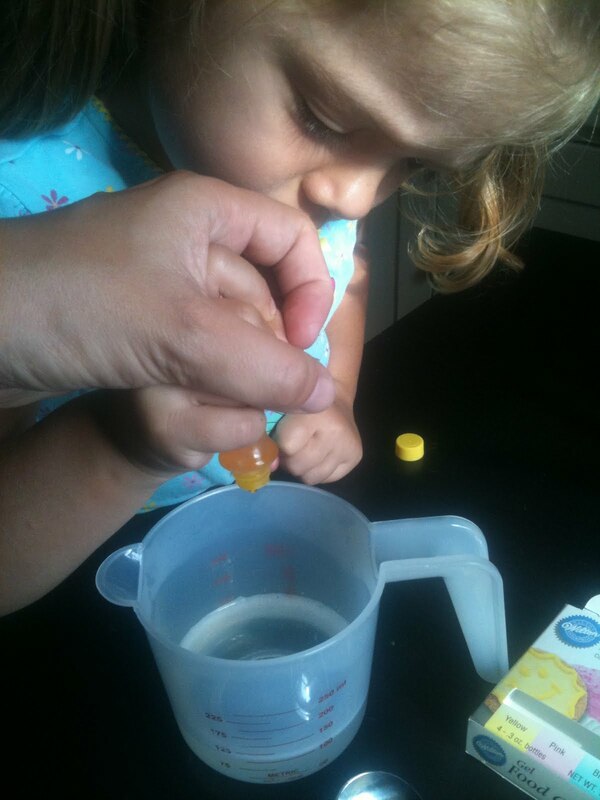 This was the Bee's job and was a nice little experiment in mixing colors, since we didn't have purple or orange food coloring and Bee made it very clear that it was essential to have purple! After we mixed each color we poured it into ice cube molds. You could do it with regular ice cube trays but we had used these long ones meant to make ice cubes for water bottles since they were a little more crayon shaped. After making all the colors we let the soap cool down and set up. Within an hour Bee popped them out of the mold and they were ready for our test run in the bath. This is so cool - I can't wait to try it. We go through a lot of those bathtub crayons, and it really adds up. Ooh, this does look easy! Fun!